The WTC Events Center and the Sheraton WTC Hotel São Paulo, together, make the most complete events complex in Latin America. 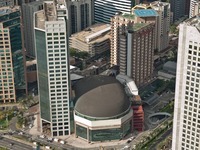 An integral part of WTC São Paulo, The WTC Events Center is located in the Berrini region, 6 km from the Congonhas airport and 36 km away from Guarulhos airport. An area of approximately 12,000 m² divided into more than 60 flexible spaces that can accommodate both large corporate and cultural events or even small events and business meetings.